Have you ever given any deep thought as to how rogue traders manage to get away with their activities for so long? In a trading landscape driven by technology, it should be impossible to get up to anything like rogue trading, shouldn’t it? Well, as we’ve seen in the recent press, it is still possible to get away with it, at least for a while, either until the rogue trader can’t hide it anymore or he brings down your firm. Both outcomes are unpleasant, to say the least. In this series of articles, we’ll explore one of the shadows where rogue traders hide – behind poor trade booking practices and weak or ineffective policy enforcement. Firms that operate in this way also have to contend with the other two sides of the “I’ve lost control of my bank” triangle, namely poor risk management and inaccurate regulatory reporting. (). So, let’s have a look at why booking policies and enforcement are critical to a firm’s health, where the pain is felt without them and where your rogue trader could be hiding. Since the severe problems encountered in the financial markets four years ago, government agencies across the globe have accelerated the imposition of increasingly risk averse regulatory reporting frameworks. This has come at a time when firms are still dealing with continually turbulent market conditions and the need to continue to make a profit. It has never been more important to know the risks that your firm is exposed to, to manage them effectively and report upon them diligently whilst still looking to maximise the firm’s assets and resources in the pursuit of that healthy profit. The question is how do you do this? How do you know what your current risk level is? There are a plethora of risk management systems and strategies in place throughout the industry that will give a clear indication of the risk that the firm is carrying and this supports strategic decision making processes. Obviously, all these systems rely on accurate data in order to ensure that the picture they paint is correct and reflects what’s happening on the shop floor. So the question is, how accurate is the data the flows into your risk management and regulatory reporting processes? The true answer, no matter how unpalatable it may be, is that years of “just get it done” attitudes to business, system and data challenges has more than likely left you with an inventory of data that, although at first glance may look OK, is in fact misreporting your risk, failing to meet your regulatory requirements, preventing you from leveraging your positions and trading limits to generate more profit and, potentially at the same time, hiding your rogue trader. To illustrate the point, let’s look at trader A working on a flow rates desk. As well as booking swaps on the Interest Rate Swap template, he has been booking fees on the same Interest Rate Swap template for the past three years, because this is the only way he can get these into the system. 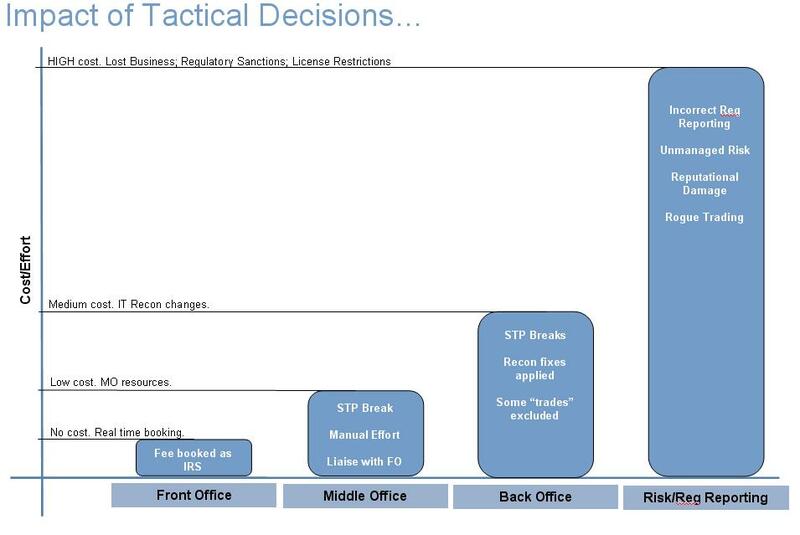 Technically, fees should be booked in a different front end system right across the firm. However, neither trader A, nor his extended team, has access to that system. This approach was the result of a poor tactical decision taken in order to expedite the processing of fees on this desk three years ago. The reasons for the decision have now been lost in the sands of time but it works “OK”. Trader A can book his fees and the money pops out at the other end so all must be well. •	are experiencing a daily, ongoing and never ending waste of effort and cash. Additionally, this poor booking practice (the “fudging” these fees into the trade capture system) has the effect of clouding the firm’s understanding of its true exposure whilst simultaneously impacting its ability to satisfy regulatory reporting requirements. So it is clear that a tactical decision made years ago, in a pressured situation has resulted in a negative impact on at least three downstream cost centres and may also be causing the bank to submit inaccurate regulatory reporting to the FSA and other regulatory organisations. Given how easily this decision appears to have been made, it is more than likely that many other such tactical decisions have been made across the firm, resulting in other potentially more unpleasant issues in risk and reporting. Let’s also not forget that this activity could be counting negatively towards trader A’s trading limits. He could potentially be doing significantly more Interest Rate Swap trades. He could be making a healthier profit for the firm. But he can’t as his limits prevent him from doing more than he is, even though a good percentage of his “trades” are actually fees. The final, logical and disturbing conclusion from tactical decisions that generate tactical system fixes to accommodate them is that these leave the firm open to exploitation. If a trader is aware of the tactical downstream “fixes” that have been implemented in order to deal with poor booking practices, it is not inconceivable that there lies a “window of opportunity” between these tactical patches that could be exploited to hide rogue trading activity. 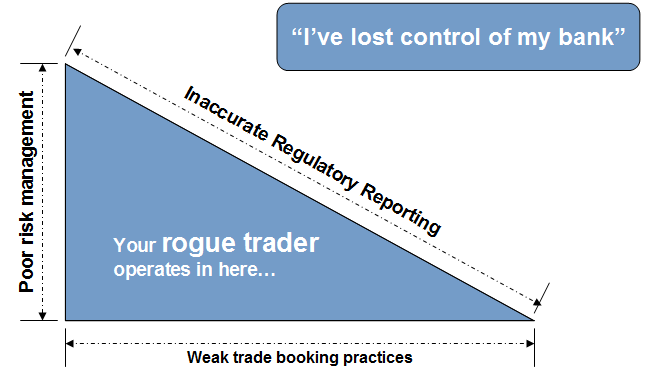 Processes that exclude a trade, because it is deemed to be a tactical fee booking, in order to protect a reconciliation process presents a rogue trader with the opportunity to manipulate this “patchy” control landscape. With the court proceedings currently underway against alleged rogue traders, it is clear that this danger is always present and systems and processes that allow themselves to be “played” only go to encourage this activity. So, what can be done about this issue? Where do you even start to determine if your data is correct? How do you determine where tactical solutions have impacted on your risk and reporting processes? Over the next few articles, I’ll explore the options available, how they can be implemented and where potential downfalls may hide. Our live Cloud-based demo integrates a Eurex clearing feed into a trade flow with complex routing rules, and is a working example of our modelling techniques. This entry was posted in Booking Practice, Risk Management, Rogue Trader and tagged booking practice, dealer mandate, fee, FSA, interest rate swap, IRS, Middle Office, misreporting, quick win, regulatory framework, rogue trader, tactical fix. Bookmark the permalink.